Utilizing the most advanced knitting technology available, First Lite is raising the bar in one of the most important areas of your hunting clothing system--your socks. The Mountain Athlete Triad Sock uses three layers of material in a seamless construction to put the important elements of comfort, durability and padding where you need it and less where you don't. Keep your dogs happy with the Triad. I have several brands of Merino socks at varying thickness, This sock has worked the best for me but today I thought I would try a pair I bought elsewhere. I am going back to my FL Triads. The FL are fairly thin for cold weather but they flat get it done and really comfortable. First issue I had with the other brand is they bunched up under my boot causing some issues walking. I’m going to buy a few new pairs of the FL Triads. Also, I like the over the calf versions. Thanks FL for making a GREAT sock for all season Deer hunting in Ky.
My feet could not be happier in these. Far and away the best sock I have ever owned. Every hunting sock I've ever had would never stay on the calf. These things just stay put and don't move. They're super comfortable and warm and the breathabilty is top notch. No smell with these socks either even after a few days in the boot. Didn't know how important socks were until I owned these. Love these socks. Not only are they warm but no matter how many times you wear them they still hold tight to the calf and feet. Any other hunting sock I've had over time stretches out and renders itself useless, not these. Never realized how important socks were to your kit until I had these. I now own two pair of these socks and after putting them through the ringer in Idaho last month I couldn’t recommend them more. Spent 15 days in the backcountry and washed these once. Switched them back and forth each day and you would think they would get pretty nasty in the hot weather but they felt fresh and odor free after a day. I like that they ride high up over my calves and have a bit of compression. I never thought I'd like over the calf socks, but I received 4 sets of these last year and I can't keep them washed fast enough. I need to order a couple more pair. I wear these for work/duty and hunting. I can get two days wear per sock without athletes foot. Something I can't do with any other sock. I have size 10-11 feet. L/XL fit a bit big, but I smaller calves. Regular human size calved people will be spot on. I use this sock for early season, Kentucky whitetails. The fabric light enough to keep my feet cool but durable enough to tolerate the slippage associated with rubber boots. When I do wear leather boots, the over-the-calf design helps keep the ticks and chiggers at bay. These socks fit extremely well, they add a little padding in your foot wear and they never seem to slide like some wool socks do. These are a really solid pair of hunting socks. They are very comfortable and warm, while still allowing enough breathability within your boot to prevent excess sweat build-up when doing intense or long distance hikes. I used these socks mostly outdoors but I do not hesitate to wear them at work. Very comfortable. Does not retain water and smell like cotton. I do not use cotton socks anymore. These pairs last 2 or 3 times longer. So they are cheaper in the long run. These socks are super comfortable. They are soft on your feet and don't creep down your calf like other wool socks. That has been my biggest pet peeve when it comes to socks. These socks stay put and do a good job of wicking sweat away from your feet. Fit was good for me. I purchased a L/XL and wear a size 11-12 boot. Great snug fitting sock with good padding under foot. The body of the sock is thin to keep it breathable and cool. Doesn’t stink and they air dry fast. The Triad sock is a quality piece of gear, they sport a soft, but durable fit. I don't love the length of the socks - going up to the knee - but wearing them with a pair of the boxer briefs covers almost the entirety of the leg without donning a pair of thermals, so there is some benefit. If you wear a lower hiking style book, you could also look at the crew sock. I use a lot of smart wool socks, these are right on par with smart wool. I love the compression support on the arch and calf area. I hiked/ hunted a lot in these socks over this last year and they are holding up great. I expect these will last a long time. Wool is the best material for socks, hot or cold. These would have been perfect for wild land firefighting. I wish I would have had a few pair 3 years ago. If you like taller socks, these are excellent. They stay in place and do not sag down. I have large calves and normally have trouble with this style of socks. But the triad sock fits great and I never even notice I'm wearing them. by far my favorite socks whether under waders hunting or fishing cold water, or under boots hunting blacktail! I have been pleasantly surprised with how durable these socks are and how well they stay in place. These are tall enough to get over my calves and tight enough to stay there without cutting off circulation. I have owned them for about a year and wore them weekly and put some miles on them they look like they will hold up for a few more years at least. A little tight to get the heal of my foot past the ankle construction but I think that's what holds it in place and prevents my boot from eating the sock. I've mostly used these as my booted wader socks. They've kept me feet warm and dry. Since they are taller socks they've kept my shins from chafing and helped my feet stay dry during the high exertion hikes in and out of the blind. I've loved them and I'd recommend them to anyone. Very tall socks covering my entire calf. They stop just before my knee cap and stay up very well. These socks are a great all around sock. The elastic band at the ankle keeps them where they need to be, and the tall height is great for not slipping down. They breath well and have good cushion on the bottom. I wish I had more pairs. To quote the great Scottish band, The Proclaimers, I would walk... 500 miles... in these freaking socks. I’ve always considered the foot, the most important part of the body when climbing, skiing, hiking, and hunting. Always spent the money on the quality. These are hands down the best socks I’ve had the pleasure of wearing. I now where them in every sport I take part in. Thanks Firstlite!! Seriously. Good socks go a long way. I never knew the material was so important. These are cushy but not too hot for 80 degree SoCal summer scouting. I would say this sock is my favorite piece of First Lite gear that I own, my wife bought me a pair for Christmas and I have used them for hiking in July, elk hunting in September, deer hunting in November and bass fishing in January. I have tried all of First Lite's socks and these are definitely the best, my feet tend to sweat a lot and when I wear their cold weather socks my feet sweat and get cold, but these are lightweight and comfortable, I never had any trouble with blisters and they actually keep my feet warmer in cold weather than the cold weather socks do. Try a pair, you won't regret it! Love these socks, warm and thin. Do yourself a favor... Spend $300 buy 10 pairs and never buy socks again.. These are solid... Perfect for the backcountry or the back 40. I picked these up for a Spring pig hunt in Central California. After 3 days, 16 miles hikes/crawled these things held up and never irritated! I am blown away by how comfortable I was that weekend with temperatures ranging from 40º-97º. I was actually really surprised with how well they wicked and how they really controlled odor. I rinsed them off with fresh water every night and by morning they seemed brand new. a bit long but they worked/felt great! I decided to try these socks out and I’m glad I did I hiked 20 miles in them in 4 days and they are probably the best sock I’ve tried so far I definitely getting a couple more pairs. I wear a size 11.5 shoe and these fit perfect. Fistlires Merino is some amazing stuff. I’ve had merino sock from quite a few other companies but these are by far the most comfortable for early season stuff. They are also thin enough that I use them as a base layer sock when doubling up. They don’t stink either. I bought two pairs of these socks last year and was able to put a lot of miles on them. I have recommended them to all my hunting buddies. I’ve never had a pair of socks that keep my feet warm and dry likes these do. I won’t go hunting without them. I got these socks from a Keep It Public conservation camp out at the end of March in Utah. These socks kept my feet warm in 40 degree weather in some crocs. I used them again at another Keep It Public conservation camp out in the South Kaibab where temps dropped into the 40’s at night and again they kept my feet warm. I look forward to purchasing these socks in the future for those October to December hunts. I wear a size 14 and the larger size sock fits prefect. I'm always nervous about new socks, especially for summer use in the mountains. I asked the CS rep about these and if I would need sock liners to pair with them, I never leave the house without sock liners. She suggested I try these sock as they are, and they were awesome. They kept my feet fairly dry and I never felt any slipping around and I was not wearing sock liners. I logged about 50 miles in 4 days with one pair of socks and they were perfect. Just air them out every night and they will perform every time! I'm buying three more pairs now. Love these socks! I rotated 2 pairs on a 7 day mule deer hunt and they served me well! Always kept me warm and dry. Little tight on my HUGE (Trump voice) calves. From bow hunting in early September to late season muzzleloader hunting these are my go to sock. Your feet stay cool and odor free on hot days yet warm when the temperatures drop. Great for hot weather use. Thin construction but sturdy. First pair of socks I've owned from FL. Breathe well and fit me great. Super comfy socks. Haven't formed hot spots yet with them on. Fully expect to use these on long back country hunts. I love these socks, even when it's 90+ in the mountains checking cameras the feel amazing. The only sock I feel I can wear more than once and be grossed out by it. They fit a bit snug around the calves, I probably should have ordered the bigger size for that reason, would be great if the re was a bit more give. I've been wearing these around the house, on long hikes and while donning waders for fishing and they are great. These reach almost to my knee, which I like; they stay up and they stay dry. I feel like I could get away with taking just one pair for week long backcountry trip. My new favorite socks for sure. I hate socks because they either don’t fit in the toes or in the heel, but these things are dope!! The compression around the ankle surprised me, but I love it!! They feel great and fit great! It's not just any merino, quality matters. Not all merino wool is created equal. This summer I participated in a Fly Fishing event that took us to backcountry waters all over Colorado. I had a new pair of the Mtn Athlete Triad socks, along with other merino brands. The difference between them was night and day. 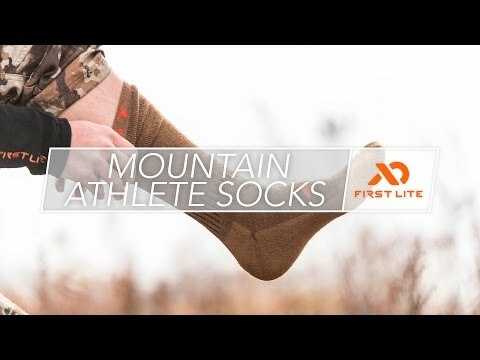 The First Lite Mtn Athlete Triad socks were comfortable, durable, better at managing moisture in my boots, and they remained significantly more comfortable by the end of a long day. After that experience, I replaced my old wool socks with First Lite merino wool socks before hunting season. Now after a full season of hunting on these socks, I'm totally sold. From elk in Montana, to pronghorn in Wyoming, to mule deer in Colorado and Texas, these are my new go-to hunting socks. I've never been one to pay much attention to socks, until now! Wore these for my first horn hunting expedition of the year and my feet never felt better. Socks were comfy, fit well, and did a good job regulating the temperature within my boots. I'm now a believer! I had my boots stretched and re-soled and forgot to reapply my Obenauf's so when I stepped out of my raft into the freezing river to head to my stand my feet was instantly soaked. I was pissed as my thought was "damn, I just wasted this entire trip and have to bail" ,I was wrong!!!! I took off my boots and dumped the water and wrung out my socks then put everything back on fast as it was only 24F at the time. My feet was toasty warm in no time and I was very happy and stayed and hunted all day-wet boots but warm feet thanks to these socks. Socks were great on their own. Padding in all the right spots. No smell after several days. Dried quickly each night and ready to go in the morning. Worn them 3 times now and love them. They stay put and have reduced fatigue in my feet. Depending on the boots I'm wearing I've worn them with and without a liner sock. They've performed equally well. Will order more. These socks are fantastic for a couple of reasons. They are tall enough to get over the calf muscle and stay up. This is important when wearing other layers of clothes because you won't have pull them up every time you stop. Another great feature is the lack of hot spots when wearing them. They are sturdy, but not bulky. They are warm when needed and don't get too hot. Cannot recommend them enough. I have calves that others have joked that I need to feed, as large as others thighs. I wish these wouldn't be so tight, I think another size up would be needed. I have hunted 7 total days so far in my socks and I can say I over them,I've always used smart wool ski socks and the first lite socks hands down blow them away! The socks are comfy,and my feet did not get hot in warm weather though rely impressed! As with all FL gear construction and feel are great, really want to use them... BUT, I ordered a Large and they are not large enough. The package the socks come in say L=9-12 but the website doesn't clarify sizing for socks, normally this isn't likely a problem for all you normal people, but I have Shideshow-Bob feet (sz16). needless to say my big feet are well beyond that size range. I tried them on, they fit OK but I'm pretty certain they'll prove too small and result in some blisters. I'll likely be returning them for more First Lite gear! This sock is awesome! I picked these up on a sale thinking that I would give a good pair of socks a try. Glad I did that. I get really hot, sweaty feet. I have tried a lot of things to fight off blisters but these are the best. Feels like wearing a sock with a liner. Now I wear them all the time! Wish I would have tried sooner! Highly recommend them. The Triad sock is extremely comfortable, durable and stays in place. I mainly use mine for hunting, long distance running and any cold weather wear. I have never had a blister, sore spot, fabric wear or odor after multiple days of use. Definitely the best socks I have used. I recommend these sock to everyone. I have worn these socks days on end and haven't experienced any fall down or odor. I even wore them breaking in a new stiff boot and the padding helped reduce the blisters and soreness associated with new boots. I would recommend them to anyone. Purchased these last season and will never leave home without them again. Literally, I love these so much that I wear them to work sometimes (and I work in an office). Breathe very well and have the perfect fit...these have never stretched out or fallen down. The merino wool essentially makes these scent free in my opinion (though when you take them off in the tent at night before bed watch out! ha). Buy these now if you haven't already - no regrets. These things are just so comfortable its hard to take them off. I find myself making sure they get washed as soon as I can so I can wear them again. Even for just everyday wear. Love them. Need to get a few more pairs!! Socks were never something I thought too much about, until I tried these. I thought fatigued feet and cold toes were a norm. Not with a quality pair such as the Mountain Athletes. A lot of foot support comes from these socks. And the warmth and comfort from these will change your day. My feet were noticeably less tired, and my toes stayed warm through wet and below freezing temperatures. Took them off and put them in the sun in midday and they were dry in 15 minutes. I can’t believe I used to wear sub-par socks. Never again. Don't be phased by the price. These socks are great. I have worn them a lot with my snake boots to keep them from rubbing and they are awesome. The wool is great because they can keep your feet really warm and absorb the sweat when it gets hotter. These socks will have you wearing them days in a row. Super comfortable and worth it. love these, wish I had more. Extremely comfortable, and incredibly durable; I've pretty much lived in two pairs between August and mid-January, hunting, and running hunts, from the mountains of Colorado, to the hills of AZ, to the river bottoms of KS, and they are STILL in great shape! I've washed them countless times, and worn them for weeks at a time (alternating between the two pairs) without washing, and they still look almost new, and still stay up 95+% of the time. My feet don't stink, I've had zero hot-spots, and no noticeable thread-wear so far. WELL worth the money.